This week a reader told Kelly Bowen that her heroine was too strong. Meanwhile, in the 21st century, we love the way Kelly brings such strong women to life in her historical romances. 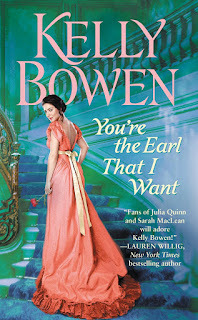 Today Kelly Bowen is sharing an excerpt from You're the Earl That I Want, in which you can see just how awesome her heroines can be. “We can’t outrun them,” Luke warned from his perch. Heath climbed into the small interior, Joss on his heels, the door clicking shut behind her. In the darkened interior, he couldn’t see her expression, only hear the sound of her rapid breathing. The carriage lurched into motion, though one would have thought the coachman were incompetent or drunk or both in the manner it slowly wove from side to side. Another shout came from outside, muffled through the walls of the carriage, and with it, the sound of approaching horses. “Ten pints,” Joss said from somewhere across from him. “Ten pints?” Heath repeated faintly. “For an average-sized man. You can measure it as a percentage of body weight, so children or someone smaller will have a good deal less, of course, but…” she trailed off. “Not that that is important at the moment,” she muttered. “Oh, dear God.” Heath realized he was clutching the leather folder in his hands so tightly that his knuckles were stiff. Distracted, he held it up, trying to get a better look at it in the weak streetlight filtering through the carriage window. Her fingers bumped his in the shadows, and she pulled the bound leather from his hands. Joss’s backside was suddenly in his face as she half crouched and turned in the compact space. He leaned back as far as he was able even as he heard a latch click in the darkness followed by the sound of a squeaky hinge and an odd scraping noise. The carriage lurched sideways, and Heath’s hands immediately went to up to steady her before he snatched them away. He shouldn’t have his hands anywhere near Will’s sister’s backside. He shouldn’t have his hands anywhere near Josephine, period. He liked the feel of her far too much. There was the sound of more latches being released, then the scrape of metal on metal. What the hell was she doing? “I beg your pardon?” He heard her thump back down onto the squabs. The riders were almost upon them now, shod hooves creating a loud clatter that rang sharply in the still night. As if on cue, the carriage groaned to a shuddering halt, as did the sound of approaching riders. A sinister silence fell all around them, betrayed only by the snort of a horse drawn up too tight and the sound of boots hitting stone as men dismounted. Heath became aware Joss was shucking her own cloak, the sound of fabric slipping over fabric audible in the quiet. She could not possibly be suggesting what he thought she was suggesting. A faint rip signaled the loss of a seam somewhere in the darkness. “It was summer. And we were children,” he spluttered. A vicious pounding on the door made him jump. “Open up!” a coarse voice yelled. Christ, but this was really happening. Heath yanked at the linen at his throat. “Come here,” he said roughly, reaching for Joss in the dimness. He found her upper arm and pulled her onto his lap, positioning her so that his back was to the carriage door and she was hidden by his body. At the very least he could protect her from whoever was outside that door. Her legs were straddling his waist, and he shoved her skirts up over her knees, allowing her to settle herself on his thighs. Joss slipped her arms under his evening coat and around his ribs as she wriggled against him. His body reacted instantly, lust spiraling, and he cursed. Not the time or the place. “What about your coachman?” Heath whispered frantically, tossing his cravat to the floor. “Nothing but me,” he whispered, his hands delving under her skirts and coming to rest on the magnificent backside he had just sworn he would never touch. “Nothing but you,” she repeated. The carriage door was wrenched open. You're the Earl That I Want by Kelly Bowen is a historical romance, released by Forever on August 25, 2015. I was born and raised in Manitoba, Canada. I attended the University of Manitoba where I earned a graduate degree in veterinary physiology and spent many years happily working as a research scientist in the agriculture industry. None of which, of course, has anything to do with writing romance novels. My writing stemmed from my lifelong obsession with history, a weakness for a good love story and after my first child was born, I sat down to do what I'd also wanted to do - write a novel. (The entire process being facilitated by the abundance of winter months that can be found in this particular province). Currently, I live in Winnipeg with my husband and two boys who are wonderfully patient and supportive of the writing process. Except, that is, when they need a goalie for street hockey.